Perfect start to your new Traditional hot rod. Feel free to stop by and see for yourself the quality of this build. What you see pictured is what you get. I have my eye on something shiny, so make me an offer. Our reproduction 30-31 Roadster comes with steel body panels stamped by Brookville Roadster, a tip out dash for easy access to the pedal assembly, wiring and gauges, a widened floor for extra foot room, tubular sub-floor, 14-gauge bonded and screwed sheeting construction, and a compact rear differential clearance pocket; the trunk assembly and doors are hinged and latched, with 28-29 style latches being used for the doors (no outside door handle). The windshield and frame is our Rotten Leonard Hallock Style windshield. Our firewall is a Rotten Leonard style, V8-stamped recessed firewall. To prevent any cracking or shrink-back in the body, the body seams have been tig welded with silicone bronze. 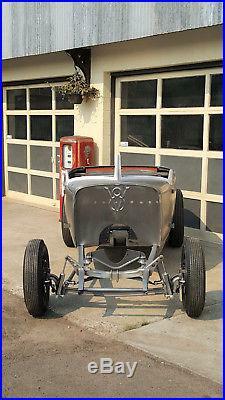 The front end of the car will be fitted with Model A wishbones, a So-Cal 4 forged drop axle, F-1 front drum brakes with new shoes and wheel cylinders, chrome dropped steering arms, and chrome front shocks with Rotten Leonard style upper shock mounts. The frame in our reproduction roadster includes JW Rod Garage frame Rails, Rotten Leonard style full boxing plates, a Rotten Leonard style heavy-duty K-Member, JW Rod Garage front cross-members, and removable wishbone mounts. We also include a Rotten Leonard, Hurst Style engine mount, and a combination transmission/ ladder bar mount fitted for the NV 3500 5-speed transmission. This transmission mount allows for easy modification for different transmissions. We also include front and rear spreader bars, rear tube shocks, a rear Rotten Leonard style drilled rectangular-tube cross-member, a Core Ford 9 rear axle with center section. Axles, and a Rotten Leonard style spring hanger with 40 Ford transverse spring. The Chassis will be constructed on your chassis table using our proprietary jigs. Bonded and screwed sheeting construction. Compact rear diff clearance pocket. Tip out dash for easy access. Hinged and latched trunk assembly. Fitted and welded RL Hallock Style windshield. Doors hinged and latched w/ 28 29. Body seams tig welded with silicone bronze to prevent shrink-back and cracking. RL stamped V8 recessed firewall. So-cal 4 forged drop axle. New shoes and wheel cylinders. Chrome front shocks with upper RL mounts. JW Rod Garage frame rails. JW Rod Garage front cross-member. Ladder bar / trans mount. (allows easy modification for different transmissions). Currently setup for NV3500 5-speed transmission. Front + rear spreader bars. RL rear spring hanger w/ 40 Ford transverse spring. Core Ford 9 rear with center section and axles. RL drilled rectangular tube rear cross-member. The car will be coming from a commercial lot in Lewiston Idaho 83501. I can help load the car day or night. 8162297 , my name is Robert. The item "30'31 Model A Roadster Reproduction Car Hot Rat Rod 32 Ford Brookville Body" is in sale since Monday, October 2, 2017. This item is in the category "eBay Motors\Parts & Accessories\Vintage Car & Truck Parts\Other Parts". The seller is "rottenleonard" and is located in Lewiston, Idaho. This item can't be shipped, the buyer must pick up the item.